A 'deep learning' algorithm trained on images from cosmological simulations is surprisingly successful at classifying real galaxies in Hubble images. Top row: High-resolution images from a computer simulation of a young galaxy going through three phases of evolution (before, during, and after the "blue nugget" phase). Middle row: The same images from the computer simulation of a young galaxy in three phases of evolution as it would appear if observed by the Hubble Space Telescope. 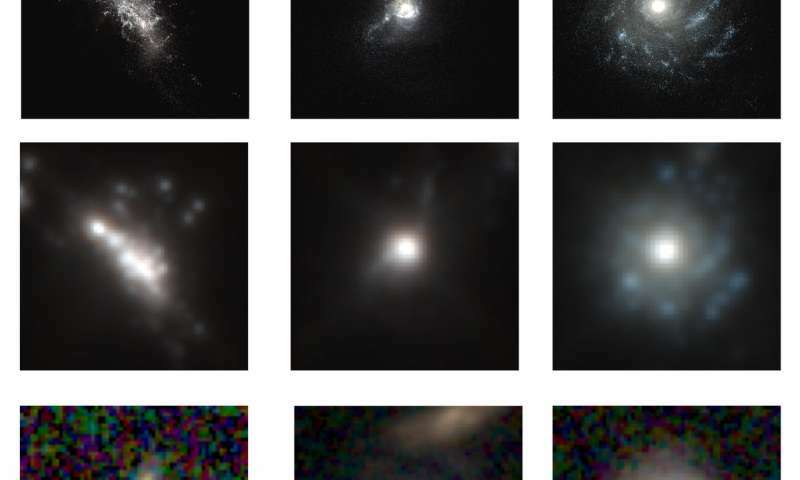 Bottom row: Hubble Space Telescope images of distant young galaxies classified by a deep learning algorithm trained to recognize the three phases of galaxy evolution. The width of each image is approximately 100,000 light years. Credit: Image credits for top two rows: Greg Snyder, Space Telescope Science Institute, and Marc Huertas-Company, Paris Observatory. For bottom row: The HST images are from the Cosmic Assembly Near-infrared Deep Extragalactic Legacy Survey (CANDELS). A machine learning method called "deep learning," which has been widely used in face recognition and other image- and speech-recognition applications, has shown promise in helping astronomers analyze images of galaxies and understand how they form and evolve. In a new study, accepted for publication in Astrophysical Journal and available online, researchers used computer simulations of galaxy formation to train a deep learning algorithm, which then proved surprisingly good at analyzing images of galaxies from the Hubble Space Telescope. The results showed a remarkable level of consistency in the neural network's classifications of simulated and real galaxies. "We were not expecting it to be all that successful. I'm amazed at how powerful this is," said coauthor Joel Primack, professor emeritus of physics and a member of the Santa Cruz Institute for Particle Physics (SCIPP) at UC Santa Cruz. "We know the simulations have limitations, so we don't want to make too strong a claim. But we don't think this is just a lucky fluke." Galaxies are complex phenomena, changing their appearance as they evolve over billions of years, and images of galaxies can provide only snapshots in time. Astronomers can look deeper into the universe and thereby "back in time" to see earlier galaxies (because of the time it takes light to travel cosmic distances), but following the evolution of an individual galaxy over time is only possible in simulations. Comparing simulated galaxies to observed galaxies can reveal important details of the actual galaxies and their likely histories. In both simulated and observational data, the computer program found that the "blue nugget" phase only occurs in galaxies with masses within a certain range. This is followed by quenching of star formation in the central region, leading to a compact "red nugget" phase. The consistency of the mass range was an exciting finding, because it suggests the deep learning algorithm is identifying on its own a pattern that results from a key physical process happening in real galaxies. "It may be that in a certain size range, galaxies have just the right mass for this physical process to occur," said coauthor David Koo, professor emeritus of astronomy and astrophysics at UC Santa Cruz. "This project was just one of several ideas we had," Koo said. "We wanted to pick a process that theorists can define clearly based on the simulations, and that has something to do with how a galaxy looks, then have the deep learning algorithm look for it in the observations. We're just beginning to explore this new way of doing research. It's a new way of melding theory and observations." For years, Primack has been working closely with Koo and other astronomers at UC Santa Cruz to compare his team's simulations of galaxy formation and evolution with the CANDELS observations. "The VELA simulations have had a lot of success in terms of helping us understand the CANDELS observations," Primack said. "Nobody has perfect simulations, though. As we continue this work, we will keep developing better simulations." According to Koo, deep learning has the potential to reveal aspects of the observational data that humans can't see. The downside is that the algorithm is like a "black box," so it is hard to know what features in the data the machine is using to make its classifications. Network interrogation techniques can identify which pixels in an image contributed most to the classification, however, and the researchers tested one such method on their network. "Deep learning looks for patterns, and the machine can see patterns that are so complex that we humans don't see them," Koo said. "We want to do a lot more testing of this approach, but in this proof-of-concept study, the machine seemed to successfully find in the data the different stages of galaxy evolution identified in the simulations." In the future, he said, astronomers will have much more observational data to analyze as a result of large survey projects and new telescopes such as the Large Synoptic Survey Telescope, the James Webb Space Telescope, and the Wide-Field Infrared Survey Telescope. Deep learning and other machine learning methods could be powerful tools for making sense of these massive datasets. "This is the beginning of a very exciting time for using advanced artificial intelligence in astronomy," Koo said.